Rapture or Great Commission? Which Leads to God’s Victorious Plan for the Church? The Church finds itself in a time of growing pressure and persecution. The constant onslaught of attacks against doctrinal truths not accepted in a culture that embraces sin and opposes God, has caused the Church to withdraw from the public arena, politics, schools and even to compromise the messages preached in Church services. The battle is raging and when the Church should be prevailing, Christians constantly talk about retreating. Retreating from the public arena, politics, schools and also retreating from the earth in the rapture. Why does the Church embrace a defeatist and escapist mentality? Is it because the Church has embraced a doctrine which has sold the idea that this world is getting worse and nothing can be done but wait for Jesus to rapture the Church out of the earth. Is this the truth? Is the rapture a part of God’s end time road map which guides the Church to its divine destination of victory, or is the rapture a detour which is leading the Church to defeat? Does the Bible teach the rapture? Does 1 Thessalonians 4:13-17 and 1 Corinthians 15:51-57 verify the rapture? Are the righteous taken in the rapture while the wicked are left behind? Did the early Church and the early Church fathers teach the rapture? 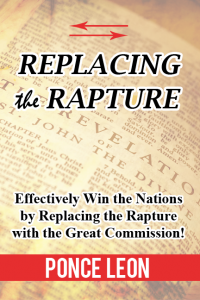 Is the rapture part of God’s plan or does He have something else in mind namely the Great Commission? Get the answer to these questions and more as the rapture doctrine is measured against the scriptures! As an ardent seeker of the truth in the Word of God I have been much disturbed by the “lame duck” attitude of such a huge segment of “the body of Christ”. This book is THE anecdote to that insidious disease of escapism that counters the character of God and belittles the finished work of Christ. Please read this book and travel through the true word and leave the “excuse fraternity” that is using confusion and fear as only the enemy of our souls can perpetrate. Be set free…..no! Accept the freedom, power and victory Jesus already paid for and taught. “Why do you believe what you believe?” This has been a question I ask of my in home church group and whenever I get an opportunity to fill a pulpit. We can not be so frozen in our understanding of certain scriptures that we are afraid to hear another point of view. The Holy Spirit will guide us into all truth if we are willing to listen to His voice through other speakers, authors, etc.. This book was a real eye opener for me, answering many question I had regarding the supposed rapture theory. It is enjoyable to read, easy to understand and will bring peace to your heart through it’s message of Grace. I plan to teach from this whenever possible!!! Brought all things together and made an awesome book. Thank you! This book has been a blessing to me, not only did it touch my heart on many different levels, it has shown me that, we are not to old to learn, and rethink the way we have been taught concerning the rapture. It allowed me to open my mind and receive in my heart the teachings of this book. It amazes me how well Pastor Ponce with his style, brought all things together and made an awesome book. Thank you, Pastor Leon, May God continue to bless you, and bring you to new levels in Him. A very compelling, mesmerizing book. To write a book on a very controversial topic and to have compelling scriptures to back it up caught me off guard. I am walking away with no doubts in my mind about what the scriptures say about who’s staying on this earth and who’s leaving, forever. God Bless you Ponce, this is truly a remarkable book. Thank you for sharing your insight on what is true and what is false. Very well written and researched, sticks to God’s opinion and not man’s, this will definitely be the most important book in your approach to life and your God gifted purpose! Easy read and have your Bible out next to you as you will see the illumination of it through God’s Word. Very informative and backed by scripture. I will re-read this book just to soak this info up. This book answers a lot of questions and gives you peace, you know the Holy Spirit is in it. I would recommend this book for all who are interested in the truth of the Word of God.